The challenge is on!! Support the campaign by D8 Director Carolyn Peters and Incoming Director Lyn Nakagawa … raise a total of $2300 and they run the 5K in hula skirts … raise a total of $5000 and Carolyn performs a “Speakeasy Charleston” dance at the Speakeasy event in New Orleans!! 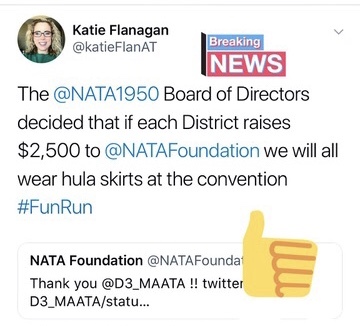 In addition, the D8 Directors challenged the NATA Board of Directors … if each district raises $2500 they will ALL wear a hula skirt at the 5K!! Let’s make it happen … text Foundation17 to 71777 or use the QR code below.